I’ll get straight to the point – I’m not very artistic. I’m color blind and I can’t even draw a straight line. I enjoy looking at art. I like the process of creative self-expression (which I usually only express to myself!). I love map-making. But if you’ve found any of my previous maps pleasurable to look at, I can’t take much credit for it. It’s mostly due to the spectacular Campaign Cartographer software and a little bit of perseverance on my part. I don’t say this out of humility (sorry, anyone who blogs has plenty of ego), but I say it to encourage those of you who are similarly inartistic. If I can make a decent-looking map, so can you. Let’s take this map as an example. Click on this image to enlarge it and you’ll see how utterly lame it looks. It’s just a bunch of bland text on random blobs of color. I’ve seen very few things this unexciting in my lifetime. To be honest, I can barely even tell that it’s a map. Now, here’s where the magic comes in. 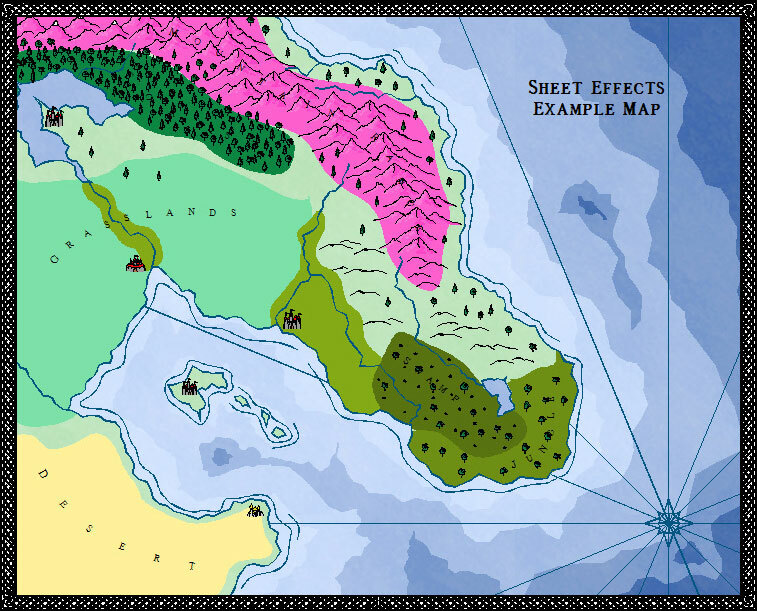 Using the Sarah Wroot style pack from the The Cartographer’s Annual Volume I, I was able to make my map look like this just by clicking the “Activate Sheet Effects” option. Just one click of the mouse and we get beautifully blended terrains, dynamic oceans and vibrant text labels. 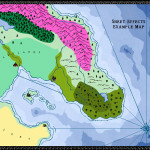 Granted, this map isn’t great yet – I only took about 10-15 minutes to lay down the colors. But if I took a little more time, I would have a polished map, ready for your scrutiny. So if you’re not a great artist but want to make great looking fantasy maps, do yourself a favor and pick up a copy of Campaign Cartographer. I looked at Campaign Cartographer, and I looked even more seriously at City Designer, but I had a problem with City Designer: It seems that all the screen shots and sample maps are of cities built on plains. Sure, they have rivers running through threm, but can you build a city on the side of a hill, and does the terrain get accounted for in the end layout and look of the city? @BB – I agree that indicating elevations in cities is not one of CC3’s strengths. It can be done, but it certainly requires a great deal of proficiency with the software. That being said, I haven’t found ANY mapping software that makes it easy. Here is a quick and dirty example I whipped up of a hill in a city (click here). This was pretty easy to make using shadows, blurs and bevels – but it’s pretty basic. The real difficulty is if you want to have multiple levels with buildings, like maybe a city that winds down the side of a cliff around a waterfall. There is nothing native in CC3 to handle that (that I know of). You would need to do a lot of customization like reducing symbol sizes at lower levels, fading colors, etc. in order to get the effect you want. CC3 has Sheets (similar to layers in Photoshop) that would make the project doable, but it’s definitely not something you could whip up in just an hour or two. Yeah, I was afraid that’s what you were going to say. 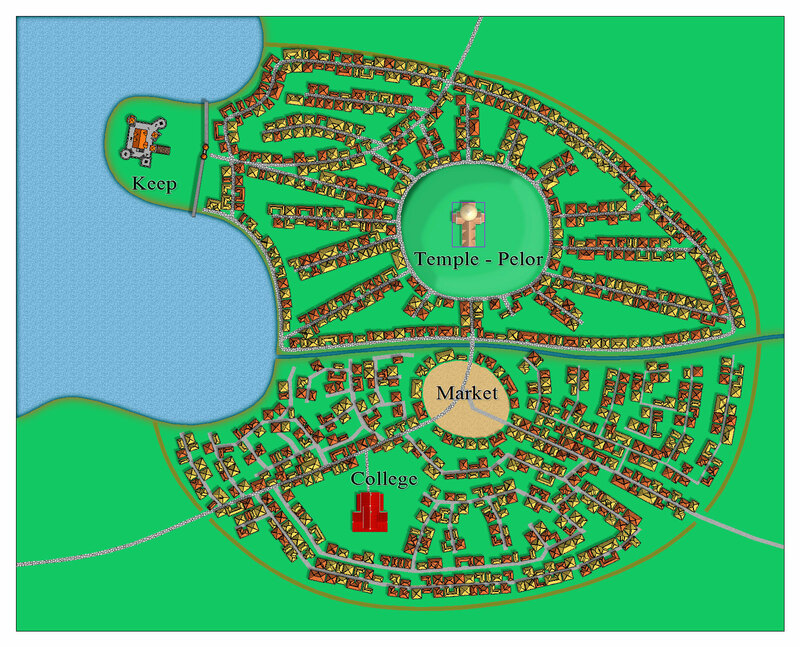 I’m trying to design a town based on the medieval European model — most of the city on a hill, close to navigable water. I want different streets at different elevations.